A golf rangefinder is a very useful accessory for improving your game. It is a device that is used to accurately measure the distance to objects such as hazards, greens and pins. If you play at a higher level and want precise yardages into greens, it makes life much easier for you. In fact, without a rangefinder, obtaining yardages can be very difficult for the average golfer. Rangefinders use either GPS or laser technology to do the measuring. Rangefinders have many features and they are applicable based on your level of comfort and experience. Because there are so many rangefinder options to choose from under many different brands, it can be difficult to narrow down which rangefinder is best for you. 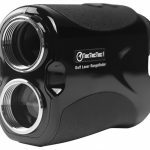 In order to get information which will help you choose a good model, we have provided reviews of what we think are the best golf rangefinders currently on the market. We base these choices on our own personal knowledge of their performance, their popularity, and the general reception from consumers and critics who have used the devices. The TecTecTec VPRO500 is a popular rangefinder because it is relatively cheap and does a great job. The VPRO500 offers versatility and accuracy. If you want a top quality rangefinder, this is one of the few that fit the bill. It can scan up to 540 yards. It has Pinsensor technology to measure overlapping objects with a good degree of accuracy. It is ideal for measuring hazards and golf flags. It has three modes to track its subject: First Target Priority, ProScan, and Distance Target Priority. It can focus on an object such as the flagstick without getting distracted by surrounding objects. It has continuous scan mode. It has a tough body that is resistant to both water and dust. It does its measurements very quickly – just point it at the target and it provides the measurement immediately. It has great clarity. You can adjust the eyepiece for a clearer image. It is easy to handle and carry around during tournaments since it has a small case and a strap. It’s black in color, and hence it can camouflage with other dark-colored gear making it difficult to locate. It is a fantastic rangefinder if you want to have your measurements done promptly. It makes life easier for you if you are still finding your feet on the golf course. It is precise and easy to use. 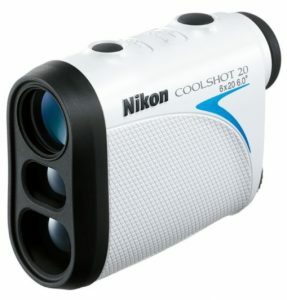 Considering its features, it is one of the best golf rangefinders for the money. The Bushnell Pro X2 rangefinder has great features that include a dual display and 6X magnification. It has a sturdy casing to protect it from harsh weather conditions. It has a good grip making it easy to use and carry around on the golf course. Its ranges are 5-1, 450+ yards to flags, 300 yards. It has Slope Compensation technology – you can use this feature on the golf course to generate more accurate readings based on the degree of slope. This feature can be toggled using the Slope-Switch. Dual Display feature. The Pro X2 allows you to pick the most appropriate display based on the lighting or weather conditions. You can choose between a sharp black and a vivid red display. JOLT technology. This lets the golfer know through short vibrating pulses that they have locked on to the flag. PinSeeker technology. This combines with JOLT and allows the rangefinder to easily locate the flag. It’s one of the star functions of Pro X2. Sturdy structure. It is well protected by its cover both from impact and the weather. JOLT technology enables you to know definitively when the laser is locked on to the flag. Two display modes ensure accuracy regardless of the prevailing conditions. The Slope-Switch technology allows you to switch into and out of the slope compensating feature at will. It can be intimidating to use at first – you have to get used to its features. 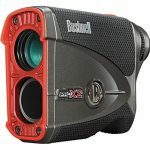 The Pro X2 is one of the best golf rangefinders on the market. 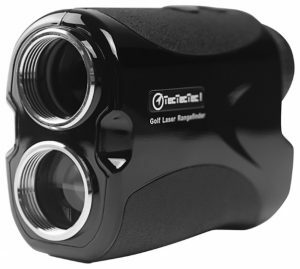 It is tournament legal and is proven to be one of the most advanced rangefinders that is used by many professionals. If it is good enough for the professionals, we cannot doubt its quality. 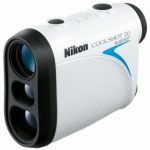 If you don’t want a large, expensive rangefinder, the Nikon Coolshot 20 is a great option as it’s neither of those things. It is small in size so that you can put it in your pocket and walk around. In addition to being portable, the Coolshot 20 has some really great features. It can measure between 6 and 550 yards. It has a first target priority feature that measures the distance to a flag while ignoring other objects that are in the background. It has an 8-second scanning feature which allows you to find distance to multiple targets after pressing the power button. The scanning feature lasts for 8 seconds, allowing continuous measurements during this duration. Has useful, quality features like 8-second scanning and first target priority. Doesn’t have a great range. It does not cover as large a range as advertised. You need to be steady with your hands since it’s very light. It may not have the flare of its more expensive counterparts but it delivers brilliantly considering its low price. You should buy the Coolshot 20 if you want a rangefinder that is cheap, value-packed and highly portable. 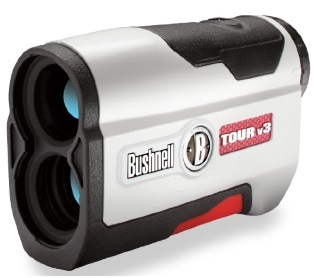 The Bushnell Tour V4 Jolt rangefinder uses a highly precise laser to measure distance. It has a massive range, allowing it to scan over longer distances, and it has exceptional clarity due to its 5X magnification feature. Has PinSeeker technology with the JOLT feature – this alerts you when the laser has locked onto the target (flag). It can measure accurately over a range of 5-1000 yards and more than 400 yards to a flag within a yard. It has 5x magnification so that you can see things in greater detail. It is legally endorsed for tournaments and can be used by professionals. Has a clear display on an LCD screen with text that is very easy to read. Excellent clarity as a result of the magnification capabilities. Does not have a slope feature. 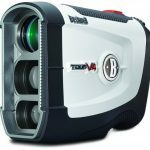 Since the Tour V4 JOLT is used by many professionals on the PGA Tour, you can be sure that it is one of the best golf rangefinders out there. It is very accurate, very easy to use, and although it does not have slope measurement, it has great clarity. 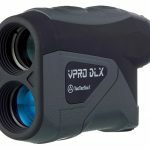 With a very simple design that includes only two buttons, the TecTecTec VPRODLX golf rangefinder is ideal for someone interested in a simple measuring device equipped with basic functions. While it has simpler features than those of other competitors, it is important to note that it is of very high quality. Simple design that is easy to use. At under 7 ounces, it is very lightweight and ideal for carrying around the golf course. Compared to many of its competitors, it offers a wider measurement range. A multilayer lens allows for clearer images. Easy to find flags with Pinsensor. Ability to receive measurements of multiple targets comes in handy for avoiding hazards. It can be used in the rain without a problem. Yardage error margin means that pin distance readings are often off by a couple of yards. Does not include slope measurement, and so you may not get a very accurate measurement on a hilly golf course. Not as easy to focus the lens as other rangefinder models. The VPRO DLX has certainly earned its spot among the best selling rangefinders. With very good accuracy, Pinsensor, scan mode and other features that allow for a comfortable measuring experience, this relatively affordable rangefinder is an extremely good investment. 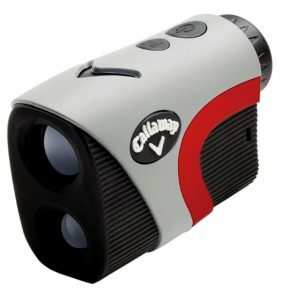 The Callaway 300 Pro golf rangefinder is another top seller with more complex features. It has one of the biggest measurement ranges on the market and has definitely made a great impression among golfers. This rangefinder ranks among the very best, and it’s difficult to find any flaws in its overall design. Slope measurement feature allows for a more precise reading by measuring uphill and downhill angles and adjusting the distance. This feature can be easily turned off in order to comply with tournament regulations. Lightweight at 7.58 ounces, minimizing arm fatigue. Its measurement range beats that of many competitors. Offering two different units of measurement makes the Callaway 300 Pro more adjustable to user preferences. P.A.T. locks onto pin from up to 300 yards away. It makes a chirping sound once locked. Use the scan mode to measure the distance to any object you point the laser at. 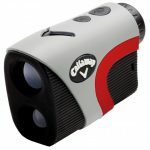 With more features than what a normal rangefinder typically requires, the Callaway 300 Pro can be best appreciated by someone with previous rangefinder experience. With slope measurement, P.A.T., a huge measurement range and other features, it comes as no surprise that the Callaway 300 Pro is a favorite among golf rangefinder users. 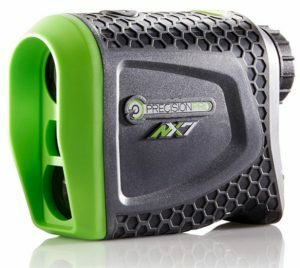 As probably one of the most accurate rangefinders you will find out there, the Precision Pro NX7 has got you covered. Its most important quality is its accuracy, giving you 1/10 yard measurements. This is the most important component of the rangefinder, and the Pro NX7 has certainly got it all figured out. Aside from mastering accuracy, this rangefinder includes various other features that further reinforce its success in the market. Slope measurement for more precise readings. This feature can be easily turned off. Target Acquisition Technology (TAG) – TAG locks the pin on a target and slightly vibrates once locked. When compared to other rangefinders, the Pro NX7 offers some of the most accurate readings, measuring to the tenths. Slope measurement can be easily turned off. 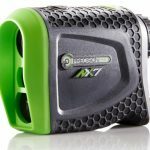 As one of the highest-rated golf rangefinders available, the Precision Pro NX7 certainly stands out with its unique, state-of-the-art design. Not only does it include some plus features, but it also delivers on the high accuracy that it claims. What this rangefinder offers is worth every single dollar it costs, and in our view, it’s definitely up there as one of the best. There are many rangefinders on the market and choosing the ideal model is not easy. The best golf rangefinders allow you to see far off objects that you cannot see with the unaided eye. The fact that you will probably be looking to buy one online can make it easier to judge which one will suit you, but it nevertheless remains challenging to come to a decision. If you are a seasoned player or even a professional, you will quickly know what to look for. If you are a novice, chances are that you won’t. This guide will provide you with the information you need in that regard. The rangefinders on the market can go for a wide range of different prices. There are cheaper ones and more expensive ones. Basic economics dictates that you buy the product that is within your budget. If you have unlimited resources, go for the most advanced rangefinder you can find. If, like most people, you have constraints, find one that is within your budget with desirable features. Bushnell, TecTecTec and Nikon are examples of companies that offer quality, affordable rangefinders. This is a fundamental property you need to check when buying a rangefinder. Rangefinders will only work from so far away. There are some that cover a distance of 1000 meters, 1500 meters and so on. You can read reviews of other customers that tell you what they know about the range of a particular rangefinder. Sometimes, the range stated by the manufacturer is not entirely correct. Rangefinders are either powered by non-rechargeable batteries or have to be charged every now and then. It all depends on what you want. The rechargeable ones are quite light but they need some downtime recharging. The battery powered ones can carry on for a sustained period as long as you can replace the battery when the juice runs out; however, the cumulative cost of buying batteries can be quite high. Nowadays, rangefinders use laser or GPS to calculate the distance. Some use both methods. It is up to you to decide which method of measurement suits your preferences. Keep in mind that GPS rangefinders calculate distances faster but you may have to pay a subscription for the service. Things like magnification, the units (meters or yards), and advanced added features can be important as you scout for the perfect rangefinder. Check the weight of the gadget, how it handles (texture), and other factors. If you are buying a rangefinder, the warranty is an important factor. A good warranty can save you a lot of expense if something unexpectedly goes wrong with the device. If you want to know if you can use your rangefinder on golf tours, find out whether or not it has been approved by the USGA. 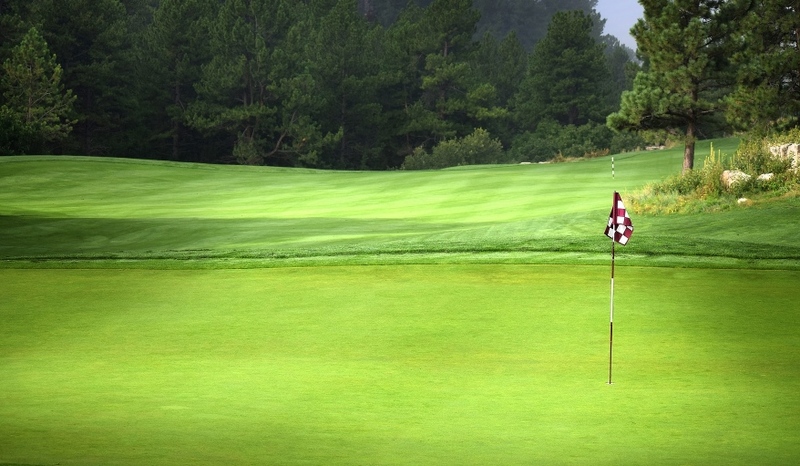 USGA approval is not necessary if you only play recreationally with your friends. A rangefinder can be a huge boon to a golfer’s toolkit. Finding one that does its job reliably is actually pretty easy if you know what you want. Each of the rangefinder models listed above deliver exceptional performance. We’ve given you the information you need; now it’s up to you to determine which one suits your needs and you like best. There are many features to look out for, and while no rangefinder ticks all of the boxes, many do well to satisfy the majority of them. I highly recommend reading customer reviews on Amazon and other sites to acquire some useful insights as to how the rangefinders actually perform. This way, you can determine the best golf rangefinder for you. Thanks for reading this guide. 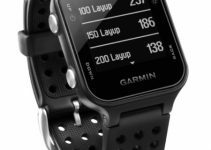 Feel free to share, leave a comment below, or check out our guide for the best golf GPS watches here. The great thing about the VPRO500 is that you don’t need to think twice about the distance. It’s a budget-friendly rangefinder that helps you find the right distance to flags and trees in less than a second. It provides you with a clear picture so that you can take your game to the next level. I also found it to be very light weight, a feature which makes it easy to handle and carry around during tournaments (and I play them regularly). If you are looking a solid, reliable rangefinder at an affordable price point, I can’t recommend the VPRO500 enough. Thanks for the article. I think that at a minimum, thousands of consumers would agree with you Chris. For the VPRO500 to have a rating of 4.3/5 with over 2500 reviews is just astounding. Many golfers I know use the VPRO500, and the general consensus is that it delivers quality performance. Thanks for your comment! Great writeup on the best golf rangefinders. 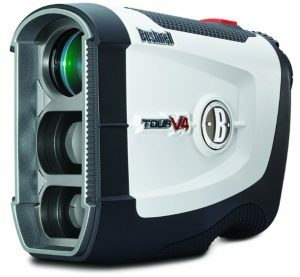 I’ve been golfing for a couple of years now and I’m looking to get a quality rangefinder – this helps a lot. Right now I’m torn between the TecTecTec VPRO500 and the Bushnell Tour V4 JOLT. The Tour V4 JOLT is obviously more expensive, but it’s hard to look past the popularity of the VPRO500. I know this is a tricky question to answer, but I’ll ask it anyways: which one would you recommend between the two? I know that the slope feature is absent on both. I assume that you have the VPRO500 as #1 on the list for a reason? Thanks in advance! Hi Kel, thanks for checking out the page. 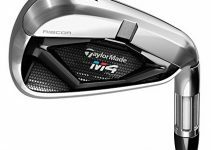 Those two models are both great, but the Tour V4 JOLT offers more in terms of range. At the same time, the Tour V4 JOLT can do a 5X magnification while the VPRO500 can do 6X. I would say that it depends on your budget and what features and specs you like better. If money is an issue, perhaps you should go with the VPRO500. If you decide on the Tour V4 JOLT, have a look at the Patriot Pack. Sorry that I couldn’t be of more help. Good luck! Sometimes it can be difficult to lock on to the object you want. Most golf rangefinders handle this problem well, the Callaway 300 Pro included. I’m glad you’re having a good experience with it. Thanks for the comment. I’ve used Bushnell Pro X2 myself – its extra weight makes it more stable in the wind, which is nice. The reality is that lighter doesn’t necessarily mean better. The material is also quite rough which promotes a firm grip – another thing I liked. Toggling the slope feature is very easy as you only need to flick a button. At the same time, the button can be tripped a little too easily, so you have to be very careful with where you put your fingers. I just wanted to share a bit of my experience with the X2 for readers. Thanks for the recommendations Paul. Thanks a lot for sharing. I can pretty much confirm what you say about the Pro X2 – definitely a great option. As you mention, though, you need to be careful not to hit any buttons or switches accidentally. Hey Paul. 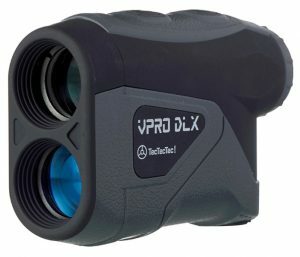 I have used several of these, and in my experience, the Precision Pro NX7 is one of the most accurate rangefinders on the market. Most laser rangefinders require some degree of patience before locking onto your target, but with the NX7, locking on and getting accurate readings is a relative cinch. Its zoom feature is also better than other rangefinders which sacrifice some quality at higher magnifications. The ability to switch units of measurement is also nice; my brother also uses the rangefinder, and he prefers readings in yards as opposed to myself preferring meters. Paul, which of these models have you tested personally? I’m just curious. Indeed, great accuracy is a strong point of the NX7. Thanks for sharing your story. To answer your question, myself and my team have tested every single one of these models between ourselves. In terms of performance for money, while all are excellent, we feel that models 1-5 have a very slight edge over the rest. With that said, any model listed here is just as viable as the rest. I hope this helps! A rangefinder is one of the easier ways to improve your golf game. Why? Well knowing accurate distances goes a long way in helping with club selection. Sure, it might not help your swing, but knowing the right club to use out on the course provides an advantage. 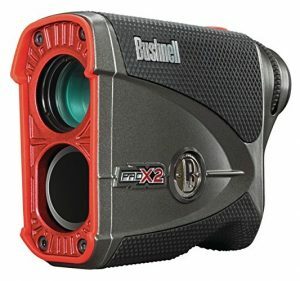 If you want the best golf rangefinder on the market, you need to check out the Bushnell Pro X2 Jolt Slope Rangefinder. These are good rangefinder recommendations. I have several friends who use the VPRO500 and think it’s great.